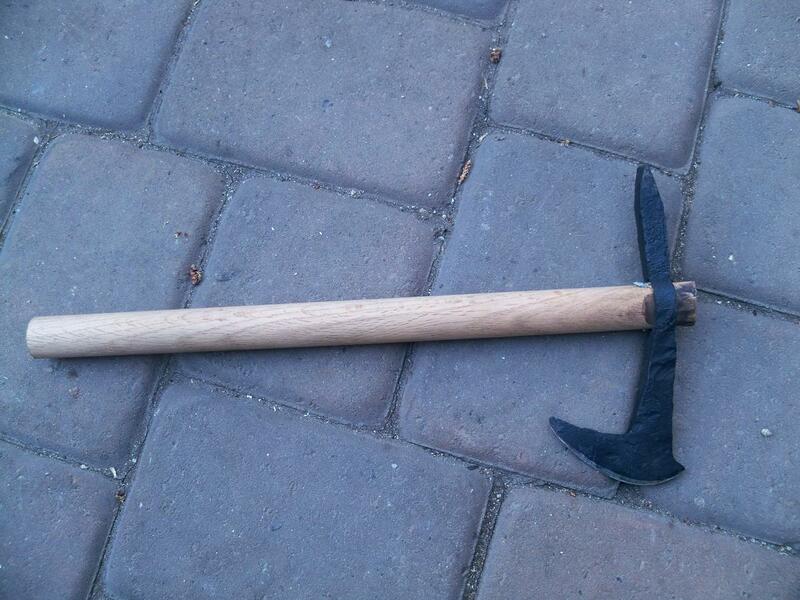 Railroad spike recycled into small bearded pick axe. Oak handle. Throws well but has many problems. A work in progress in regard to the technique. 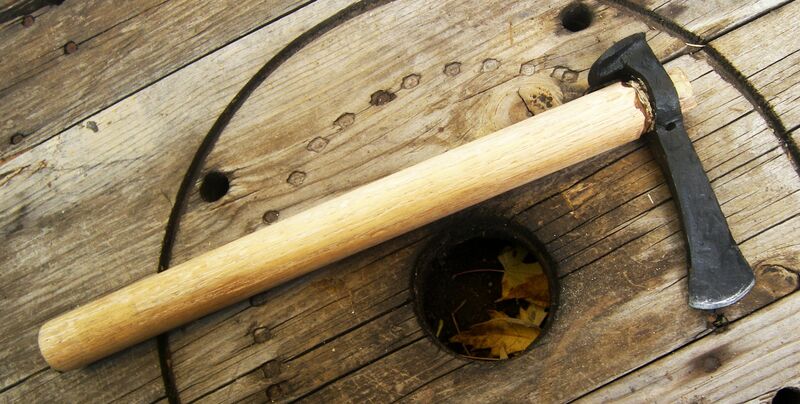 STEP BY STEP PROCESS FOR FORGING A RAILSPIKE BEARDED HAND AXE: 12 STEPS. STEP 1: Acquire a Railroad spike marked HC. STEP 2: Heat in forge till bright orange. Remove and allow to fully cool. STEP 3: Heat your spike in the forge to Bright orange/Yellow. STEP 4: Center your “hot” cutting chisel on the spike. Strike 3-4 times and then remove and cool the chisel. Re heat. STEP 5: Repeat step 4 on top and bottom of spike until the hole meats in the middle. STEP 6: Once the hole is cut through, begin eying the spike with drifts until the hole is round enough to accept a handle. STEP 7: Begin shaping your blade from the head of the spike. Be patient and slowly draw the steel out. STEP 8: When satisfied with your blade’s shape allow to cool and grind your final shaping details in to the head. 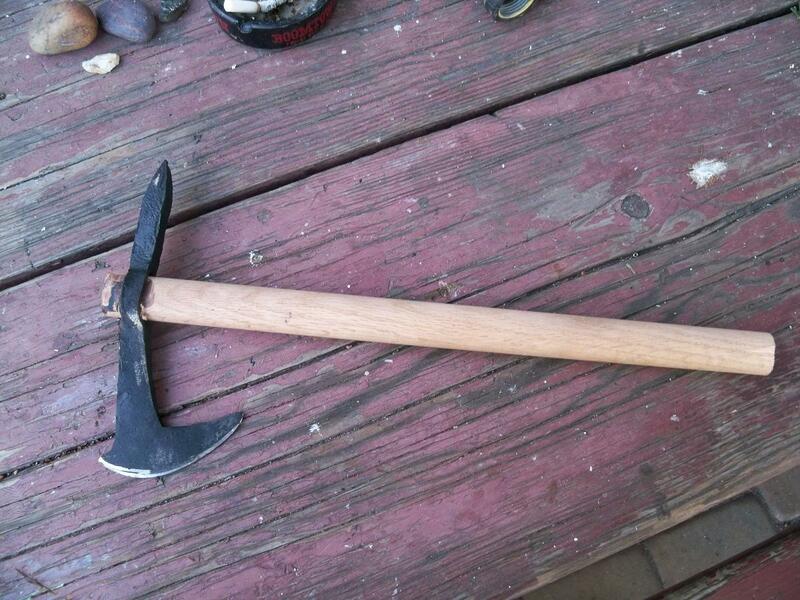 STEP 9: Forge and shape the spike end of your Axe if desired. STEP 10: sharpen blade edge and prepare to heat-treat. STEP 11: Heat to bright red and quench in water. STEP 12: Polish and mount on handle. FORGING THE HAMMER-AXE VARIANT: 4 Steps. STEP 1: Heat spike tip to bright orange/yellow. STEP 2: Place spike in a heavy vice and begin hammering the tip flat. STEP 3: Hammer until the tip of the spike is 1″ by 1″ roughly. STEP 4: Begin drawing out until desire shape is reached. I hope this helps with your Spike/Axe project! This entry was posted on January 28, 2011 by .. It was filed under Knife making-Blacksmithing and was tagged with bearded axe, coal forge, forging, ironwork, metalwork, railroad spike, railspike axe, railspike knife, throwing axe, tomahawk.